Directed by Jordan Vogt-Roberts. Produced by Thomas Tull, Jon Jashni, Mary Parent, and Alex Garcia. Written by Dan Gilroy, Max Borenstein, and Derek Connolly. Release date: March 10, 2017. It would have been pretty difficult to be worse than 2014's Godzilla, and thank our lucky stars that Kong: Skull Island never sinks to that level of tedium and boredom. Here we have a very expensive monster movie that doesn't have any pretenses about being anything more than a very expensive monster movie - except that it also has to kind of, sort of, continue to establish the very expensive giant monster movie universe. That's not a far off name, apparently, as this shared continuity is being called the "MonsterVerse." The movie is set in the early 1970s, right at the tail end of the Vietnam War, and sees a group of way, way, way too many people to keep track of go to a previously uncharted island. 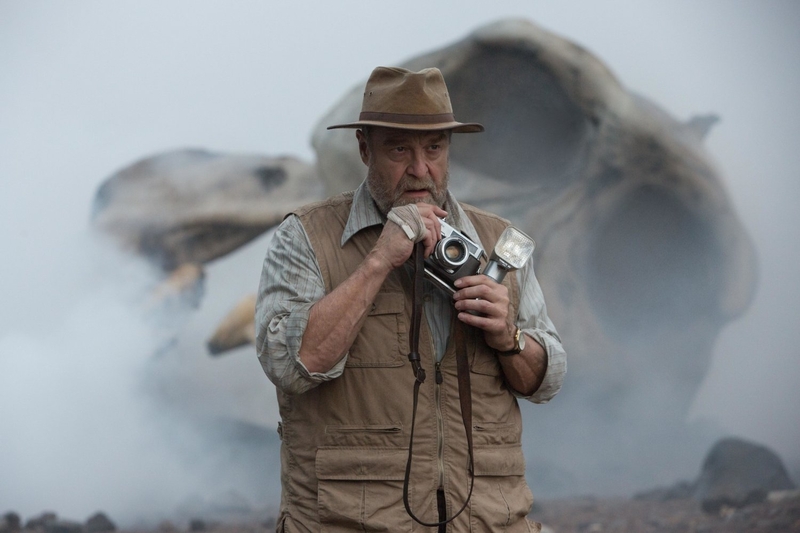 They're going under the guise that all they'll be doing is mapping it, but Bill Randa (John Goodman), who works at the monster-tracking/hunting organization called "Monarch," knows better: there's something monstrous on the island, and he wants to document proof of it. Then people will stop calling him crazy, and maybe us humans can start planning a way to defend ourselves against any giant monsters. We know that worked so well in Godzilla. Upon getting to the island, a giant ape called "Kong" appears and, well, goes ape on all of them. A significant portion of the unnamed characters die. The ones played by name actors get to live and wind up separated into two groups: (1) soldiers led by Samuel L. Jackson's Colonel Packard and (2) a bunch of other people led by a hired mercenary tracker, James (Tom Hiddleston). The groups have three days to get to the North part of the island, which is where they will be rescued. They have to deal with non-Kong creatures as well as their own various motivations for coming on the expedition, both of which threaten to prevent rescue. 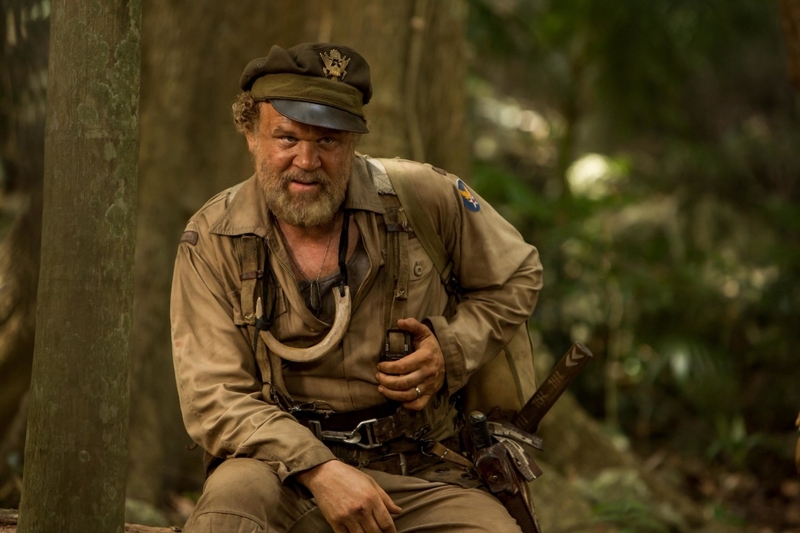 That would be interesting - a "which aspect is more dangerous" type of scenario - if any of the characters were actually worthwhile, but apart from the one played by John C. Reilly, who was stranded on the island 20+ years before, none of them really amount to anything. Jackson's character is just semi-secretly set on revenge ... and that's really the only one that factors in. I had to look up almost every character's name - there are too many of them and they're all too shallow to matter to the audience. Kong: Skull Island is the type of B-movie that kids will love, parents will love if they don't want to think or care a whole lot, and we'll all forget about it in a couple of weeks until the next MonsterVerse entry starts its promotional cycle. No, we're here for the various creatures and monsters, which is where Kong: Skull Island offers its biggest improvement over Godzilla. We see Kong's hand in the first sequence of the movie, and as soon as we get to the island he shows up. He's frequently on screen, and we even get to see him fight a couple of the other creatures - you know, unlike how Godzilla kept cutting away from the action we actually wanted. The special effects are fantastic. Kong himself has been mo-capped, much like what happened in the 2005 movie, but since we're now living in a post-Caesar world, expectations are even higher. Kong looks great, never once feeling out-of-place with our real-life characters. The primary antagonists come in the form of "Skullcrawlers," which look more like they come from the imagination of a 6-year-old than anything, and not as much detail has gone into their creation. They still look good, but pale in comparison to Kong. There are a few other creatures scattered throughout the island, and they all look great. Basically, it comes down to whether or not you need interesting characters in order to care about the action that involves them - especially when most of the action is "run away until something else saves us from danger." This is a very different movie from the 2005 one, for instance, which actually developed its characters and allowed time for things like nuance and depth. For some people, it was too long, and waiting an hour to see the feature attraction was too much. They will take to Kong: Skull Island like a monkey does to bananas. Yes, I know Kong isn't a monkey. Shut up. 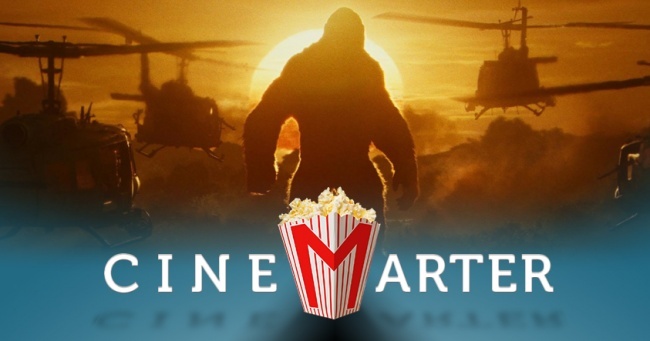 Kong: Skull Island is the type of B-movie that kids will love, parents will love if they don't want to think or care a whole lot, and we'll all forget about it in a couple of weeks until the next MonsterVerse entry starts its promotional cycle. That's fine, I suppose. There's not a whole lot to hate here - it's a big, dumb action movie, one that's relatively entertaining and only marginally consequential. Come for the spectacle ... but probably don't expect much more. Bottom Line: Kong: Skull Island is an improvement over its MonsterVerse predecessor, but still a dumb, shallow film (that's kinda fun). Recommendation: Want a giant monster movie in which the giant monster is a focal point? Well, you'll probably enjoy this - you just won't have much to think or care about.